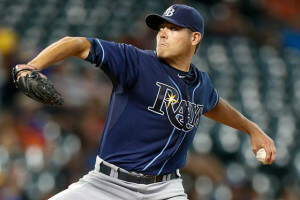 Tampa Bay Rays lefty Matt Moore will not return to the rotation this weekend and the team isn’t sure when he will rejoin the rotation. The All-Star is out with a sore left elbow. He had hoped to return this weekend, but reportedly was not feeling 100% after bullpen session before Wednesdays game against the Seattle Mariners. Moore said he won’t throw again until Sunday. Moore is 14-3 with a 3.41 ERA and felt discomfort in his start against the New York Yankees on July 28 at Yankee Stadium. “It’s doesn’t feel right,” he said. “From the aspect of throwing 30, 40 pitches into my bullpen, I’m not at a place where I’d normally be 30, 40 pitches in. Desmond Jennings took 20 swings off a batting tee Tuesday, the first time he’s swung a bat since going on the DL with a fractured left middle finger Aug. 6. Jennings is scheduled to come off the disabled list Monday and said he hopes to be in the lineup that night when the Rays open a three-game series in Baltimore.